There’s been a lot of heated discussions in the blogosphere in the past month about mobile platforms from independent developer perspective. Which platform to choose, if you want to develop cool applications, reach a lot of users and maximize your revenues? I previously wrote on this subject a year ago, when Android was announced, and three years ago, when I was really disappointed by a pretty much dead S60 applications market. This time it started with a great presentation by Teemu Kurppa (a mastermind behind mobile Jaiku) at MobileDevCamp Helsinki – “Platform = Stage. How to choose a mobile development platform?“. It is a must see for every mobile developer. Teemu compares the number of “educated users” for S60, iPhone and J2ME enabled phones, and illustrates that they are cardinally different from absolute numbers of sold devices/potential customers advertised by companies behind those technologies. Even if iPhone/iPod Touch has the smallest number of sold devices, it has 3x times the number of “educated users” than its nearest competitor (S60), and “educated users” are the real potential customers with the money and intention to buy. Teemu also compares the distribution channels – Apple App Store vs. S60 Download and user experience when downloading and installing applications. By far iPhone/iPod Touch coupled with App Store is the absolute winner as a development platform, if you want to maximize your target audience and profits. But there will be two major disruptions this year, trigerring a ripple effect in mobile development pond – Nokia’s global Ovi Store launch and Google’s Android Market launch in Europe. However as Ewan MacLeod reports Nokia’s Ovi Store got more than a cold reception from mobile developers in the Bay Area, who were unimpressed by “400 million Ovi compatible handsets by Dec 2010” proposition. Mike Rowehl in his rant “Please Don’t Mistake My Apathy For A Lack of Understanding” explains the reasons behind his choice of iPhone as a preferred development platform. Addressing Nokia, RIM and Microsoft, Mike wrote “Once things change, once you get your stores developed, released, and proven as a good commercial channels to end users – then we can talk again. Until then we’re all just going to keep laughing at you and developing for iPhone”. He got a reassuring comment from Lee Williams, executive director of Symbian Foundation, which I do hope is the first sign that at least Nokia starts caring about developer’s needs. iPhone was the buzzword of 2008, but I am still closely following Google’s Android development. I was really impressed by a successful example of one of my friends, who concepted, developed and published mobile application for Android in about a month of evening coding – without any prior mobile development experience, let alone Android experience. Android documentation and community, encouraged and supported by Google, allowed this to happen. With Apple being now a clear leader, and Android a strong challenger with large potential, it is going to be an uphill battle for Nokia to regain trust of mobile developers and deliver on promises of Symbian Foundation and Ovi Store. And there\\\’s more… The point you touch on about your friend being able to pick up the Android SDK and just get on with it is also a critical consideration. As well as having a route to market, developers need a good platform offering to build on. Symbian has 10 years to improve the developer offering and has failed to do so. 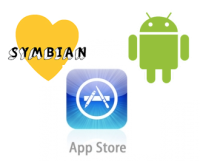 Documentation and support for Android and iPhone already surpasses the offerings surrounding Symbian. Symbian OS isn\\\’t dead, but it\\\’s time as the #1 mobile OS is already over as far as independent developers are concerned. It won\\\’t be another decade before it\\\’s no longer the #1 OS in smartphones. “Symbian is dead” – this is the statement I’ve been hearing too often lately. There must be something to it. In my opinion cross-platform development environments are solving this issue. If you are able to write one application that runs on all the underlying platforms you don’t have to worry about which device is most popular. I located Welcome to MobileCamp Montreal! | MobileCamp Montreal although searching for a specific thing different on Google, but I received the chance to experience this posting and I found it very useful without doubt.